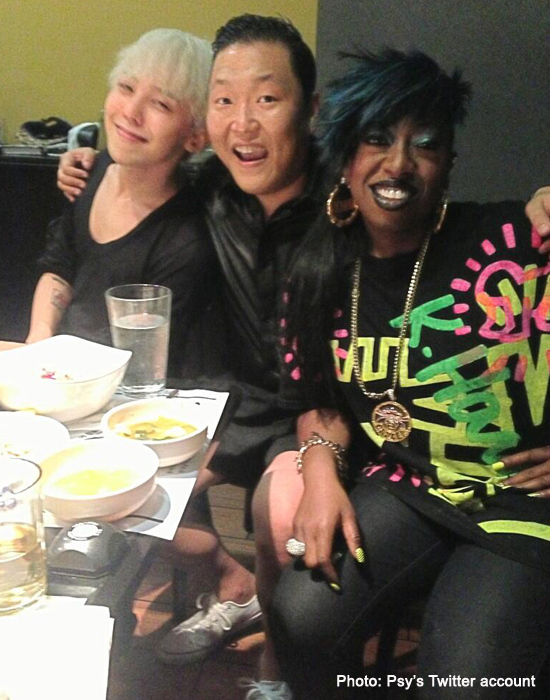 K-pop star G-Dragon's dream came true when he performed with Grammy-winning rapper Missy Elliott on stage. The two heated up KCON, the K-pop convention in Los Angeles, over the weekend when they sang together G-Dragon's new song for his new upcoming album "Coup d'etat." Missy Elliott is featured in the Big Bang leader's new song. The performance was part of Korean TV music show "M Countdown What's Up, LA?," which was taped during the convention. Days before the KCON started, there were reports that G-Dragon would be performing with Missy Elliott, which became one of the most anticipated events at the convention. G-Dragon then posted a photo of himself and Missy Elliott on Instagram last Aug. 24.
he collaboration between G-Dragon and Missy Elliott was announced by YG Entertainment CEO Yang Hyun Suk in June. He said G-Dragon's second full-length album "is like pulling out a diamond from a treasure box because the album was already in the process of making when a mini album was released last September." The YGE honcho said the upcoming album will be special as it would feature Missy Elliott. "With the 2nd solo album, what we decided to do was to have one legendary foreign artist feature in it rather than have several. There were many male rappers on the list, but what YG was looking for was a female rapper – and there was just one. We found the answer so quickly and we were unanimous on choosing this artist. And she is – Missy Elliott," he said. Missy Elliott has won six Grammy awards including Best Rap Solo Performance for "Get Your Freak On," Best Female Rap Solo Performance for "Scream aka Itchin" and "Work It." Yang Hyun Suk said because of Missy Elliott's health condition, which affected her career, "it was extra difficult for G-Dragon to ask her to feature in his song." In 2011, Elliott told People magazine that she had Graves' Disease, which is "an autoimmune illness that affects the thyroid." YGE said for the last several months, it asked Elliott to be featured in G-Dragon's song. "We have been sending her G-Dragon-related information including his songs. And finally, we were able to win her interest for G-Dragon’s creativity and music, and now she will be featuring in G-Dragon’s new solo album," Yang Hyun Suk said. The collaborative track between G-Dragon and Missy Elliott "has a very unique hip-hop beat like other Missy Elliott’s tracks." G-Dragon wrote the lyrics and rap of the song while Missy Elliott added her own rap to complete the track, Yang Hyun Suk said. "G-Dragon’s song featuring the female hip-hop legend breaks away from the convention with a hint of Korean taste. The tinge of a voice sample from a Korean traditional folk song 'Nilliliya' makes it a one-of-a-kind, classy hip-hop track," he added. The album is expected to be released on Sept. 2, according to a teaser photo released by YG Entertainment.